Whilst looking through one of my many technical car books from the 30’s and 40’s I was reminded that there is very little that is new in the field of motoring. Some members have converted their Austin Sevens to run on 12 volt, rather then 6 volt, for many reasons. One item in the car that needs to be corrected, if that is the right word, to run on 12 volt is the fuel gauge. The simple modification is to measure the resistance between the ‘B’ terminal (which goes to the battery via the ignition switch) and the body of the gauge which is earthed. To ‘convert’ the gauge to 12 volt use simply insert a resistor in the feed from the battery which is the same as the previously mentioned measurement. It should be in the order of 33 ohms. The reminder of nothing new? Well! 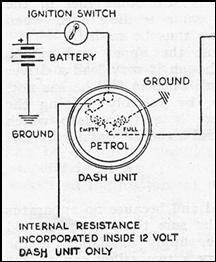 In my old book the drawing of a fuel gauge shows the resistance (effectively in the battery feed but inside the body) with an indication that the internal resistance is only used for the 12 volt version. Just as we suggest you do to convert your gauge to run on 12 volt but with the resistance outside for easy construction. You can just imagine it, the gauge manufacture, all tooled up to produce 6 volt gauges which were the norm at the time, when a car manufacturer decided to go 12 volt on their latest creation and wanted the gauges to suit. Rather than produce 12 volt gauges as such they modified the 6 volt version just in case the new fangled idea did not take off ! This article, written by Malcolm Watts, originally appeared in CA7C Seven Focus in Feb 2007 p16.